the slopes of Table Mountain. 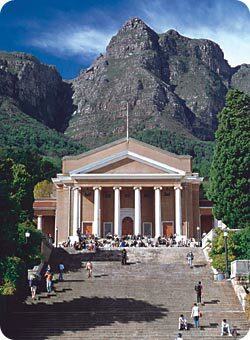 The University of Cape Town (UCT) is the oldest university in South Africa and is one of the leading universities in Africa. It has over 20 000 students with 3 600 studying for PhD or Masters degrees. UCT prides itself on a multicultural student body which reflects the cultures and religions of the diverse Western Cape region, South Africa, Africa and the world. The University welcomes international students and is currently home to over 3 000 students from 90 different countries. UCT has established a tradition of academic excellence, which is recognised worldwide. The University is privileged to have 17 out of South Africa’s 45 scientists identified by an independent audit as ‘A-rated’– those considered international leaders in their field. It is also the academic home of world-renowned authors such as Breyten Breytenbach, André Brink and Njabulo Ndebele, and has vibrant departments of African music and dance. Set in the peaceful suburb of Rondebosch, UCT is about 10 minutes drive from Cape Town’s city centre. The main campus is located on the slopes of Table Mountain. There is a subsidiary campus in the city centre for Fine Arts, a Medical School near Groote Schuur Hospital, and the Graduate School of Business at the popular Cape Town Waterfront area. For a Bachelor’s degree programme, the minimum requirement is a matric exemption. For non-English first language speakers, proof of English language ability is required. (TOEFL score at least 570, IELTS overall band score of 7.0 with no individual element of the test scoring below 6.0). Each faculty has subject requirements and acceptance depends on high school results. Faculties include: Humanities Science Engineering and the Built Environment Law Commerce and Health Sciences. The faculties are spread over UCT’s main campus situated at Rondebosch, the Hiddingh Campus in Gardens, the Medical School in Observatory and the Breakwater Campus at the Waterfront. Every faculty publishes its own handbook with detailed information. There is limited accommodation available for international students in residences on campus. Most international students join local students in shared rented houses or apartments near the University. The Student Housing Office (e-mail: res@protem.uct.ac.za) and the Off-Campus Accommodation Bureau (e-mail: caloca@protem.uct.ac.za) keep lists of accommodation. The International Academic Programmes can advice you on areas where to stay close to UCT. The first port of call should be the UCT Web site: www.uct.ac.za. International students planning to do full South African degrees at UCT should apply through the Admissions Office. Semester Study Abroad students, exchange students and short-term international affiliates, should apply through the International Academic Programmes Office. UCT employs 4 300 people, 56% of whom are administrative and support staff and 44% are academic and research staff. Sixty percent of UCT academic staff hold Doctorates. A high proportion of staff are leaders in their fields. The National Research Foundation (NRF) identified UCT as one of South Africa's leading research universities in science, engineering and technology. Research at UCT covers fundamental and applied research in Science and Engineering, in the Health Sciences, in the Humanities and in the growing field of policy research, as South Africa maps out the future of its new democracy. UCT has four of the 15 national research units funded by the Human Science Research Council’s Centre for Science Development. In the Health Sciences, UCT has the highest concentration of research centres funded by the South African Medical Research Council (MRC). These MRC research units include the Bioenergetics of Exercise Research Unit, the Cape Heart Research Group, the Ischaemic Heart Disease Research Unit, the Liver Research Unit, the Oesophageal Cancer Research Group, the Molecular Reproductive Endocrinology Research Unit, the Research Unit for Medical Genetics and the Research Group for Traditional Medicines, run jointly with the University of the Western Cape. Graduates with approved three-year degrees who wish to do a Masters or PhD degree are normally required to complete an Honours degree involving one year of specialised study. Masters degrees are offered by dissertation or by taught courses and a minor dissertation. Doctoral degrees are research degrees which may be entered directly on the basis of a first degree, or after completing a Masters degree, or by upgrading an initial Masters registration to Doctoral level. Postgraduate diplomas normally follow a three-year Bachelor’s degree. Proof of English language proficiency is required for students for whom English is not their first language. 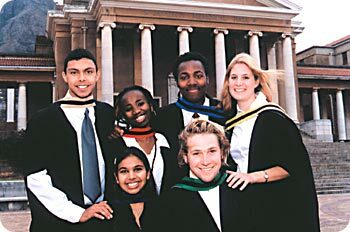 In 2003 over 400 students from different continents spent one or two semesters at UCT as part of our semester study abroad programme. UCT is in a peaceful, leafy suburb of Cape Town, one of Africa’s most cosmopolitan cities, with stunning views over two mountain ranges and across two oceans. Beautiful city: "Living and studying in Cape Town has been the best experience of my life. Not only is the University of Cape Town a good university, it is also in one of the most beautiful cities in the world." Breath-taking mountains: "I met many South African students by getting involved in the Hiking Club at UCT. Being part of the Hiking Club gave me the opportunity to go on weekend trails in the breath takingly beautiful mountains around Cape Town." Kate, University of Melbourne, Australia. Thought-provoking classes: "What a great place to learn about politics and the rebuilding of a nation. The interactions in the Politics classes at UCT were very stimulating and thought-provoking. I am glad that I could have been part of the building of the future leaders that are being produced at UCT." Alison, University of British Columbia, Canada. UCT a world-class African University! The magic of Cape Town: Multi-cultural, vibrant, historic African city, spectacular mountains, beaches, outdoor life. Wide choice of courses in six faculties: Humanities, Science, Engineering and the Built Environment, Health Sciences, Commerce and Law. Supportive International Academic Programmes Office: Over 3 000 international students, strong Semester Study Abroad programme, community service programme, International Student Organisations. UCT courses are accredited by leading universities in the world: UCT has visiting student agreements with institutions such as Leiden University, Duke University, Princeton, and the University of California. New, career-orientated undergraduate degree programmes: Interdisciplinary approach, flexible range of structured options with tight quality control. Emphasis on research and postgraduate studies: 20% of the 20 000 students are enrolled for PhD or Masters degrees, top quality academic staff. Comprehensive student services: Student Development and Services Department, extensive sports facilities, over 100 clubs, student health service, accommodation bureau, academic advisors, walk-safe scheme, shuttle service, community service options. Excellent student and research resources: Library with over 900 000 volumes, laboratories, study venues, international linkages, information technology services, field research options. E-mail: tmcrowe@botzoo.uct.ac.za Tel: + 27 21 650 3292. E-mail: thedders@botzoo.uct.ac.za Tel: +27 21 650 4037. E-mail: aroy@geology.uct.ac.za Tel: +27 21 650 2902. Master of Mathematics of Finance: This two-year programme is for students who wish to work in financial markets, especially in derivatives trading, risk management and quantitative analysis. It develops techniques for pricing and managing modern financial instruments. It is divided into coursework (first year) and a dissertation (second year). For more information, E-mail: cgtros@stats.uct.ac.za Tel: +27 21 650 3226. Master of Commerce in Economics: A one-year full-time Masters degree which incorporates advanced economics study and a mini dissertation. An honours degree in Economics with an adequate background in econometrics is required. For more information, E-mail: ablack@commerce.uct.ac.za Tel: +27 21 650 2729. Master of Commerce in Information Systems: A one-and- a-half-year to two-year full-time or two/three-year part-time programme in advanced study of business information systems. Candidates complete four modules consisting of current topics in Information Systems theory and research focused on developing a critical approach to reading and writing in Information Systems. Dissertations are also completed. For more information, E-mail: ibrown@commerce.uct.ac.za Tel: +27 21 650 4260. E-mail: wdaniels@humanities.uct.ac.za Tel: +27 21 650 4207. MA in Applied Languages and Literature Studies: This programme is offered by UCT’s Centre for Applied Language and Literacy Studies and Services in Africa (CALSSA), collaboratively with the Department of Education, the Department of Southern African Languages and Linguistics, the Department of Modern and Classical Languages, the Centre for Higher Education and Development and PRAESA. The programme offers advanced academic and professional approaches to teaching and researching the use of South Africa’s official languages in everyday contexts. For more information, E-mail: callssa@beattie.uct.ac.za Tel: +27 21 650 4110. MA in Theatre and Performance: The two-year MA offers an intensive exploration of theatre-making from the perspective of a theatre director or of an actor or performer. The student creates three theatre projects towards a final thesis production which also comprises a design component and a theoretical explication of the work. For more information, E-mail: lchristi@hiddingh.uct.ac.za Tel: +27 21 480 7166. MEd/MPhil in Education: Masters programmes in the Department of Education are offered in two parts. In the first year candidates are required to register for the Postgraduate Diploma (Part I). Successful completion of the requirements for the diploma with a mark of not less than 60% in each of the four courses entitles a candidate to proceed to Part II, registration for which is at Masters level. In addition to its postgraduate certificates and diplomas and taught Masters degree, the Department of Education offers many other courses at Honours/Masters. These courses do not require that students necessarily have education qualifications. There are courses that deal with education, policy and reform; gender and education; literacy studies; teaching and the modern condition; applied language studies; the writing and publishing of textbooks; literature and imagination; intercultural communication; and curriculum issues. For more information, E-mail: ingrid@humanities.uct.ac.za Tel: +27 21 650 2772. MA in Historical Studies: The programme will equip students for a broad range of careers in which research skills, a capacity for informed critical judgement, an effective grounding in written work and oral presentation, and an advanced ability to interpret complex materials will prove invaluable. Journalism, the heritage sector and the tourism industry, documentary film making, teaching, publishing, museum and gallery work covers some of the areas programme. For more information, E-mail: bren@humanities.uct.ac.za Tel: +27 21 650 2742. Tel: +27 21 650 3093. Master of Landscape Architecture and Planning: The degree programme is a two-year, full-time course. It is integrated with related programmes in Architecture, Urban Design and City and Regional Planning. For more information, E-mail: archiplan@ebe.uct.ac.za Tel +27 21 650 2374. E-mail: faculty@ebe.uct.ac.za Tel: +27 21 650 2699. Master of Philosophy in Critical Care: This course provides a thorough knowledge of the basic sciences relating to physiology, pathology, microbiology, pharmacology and clinical measurement; general internal medicine, anaesthesia, surgery and radiology particularly related to critically ill patients and acute emergency medicine. For more information, E-mail: medfac@curie.uct.ac.za Tel: +27 21 406 6346. Masters of Philosophy in BioEthics: This part-time degree, extending over two years, develops a deeper understanding of the theoretical and practical aspects of ethical issues in public and private life. For more information, E-mail: medfac@curie.uct.ac.za Tel: + 27 21 406 6346. Tel: +27 21 406 6346. Why not do a Postgraduate Degree at UCT? If you want an excellent postgraduate qualification look no further than UCT. The university is committed to building on its international reputation by offering exciting opportunities for postgraduate research and learning, and a wide range of postgraduate degrees in all disciplines. UCT offers over 65 Masters degrees. In response to market needs, an increasing number of these have a significant coursework component. A few of the many options available are listed below. Details about other Masters and postgraduate courses can be obtained from the UCT website at www.uct.ac.za/postgrad/deg_dip.php or under individual departmental listings.